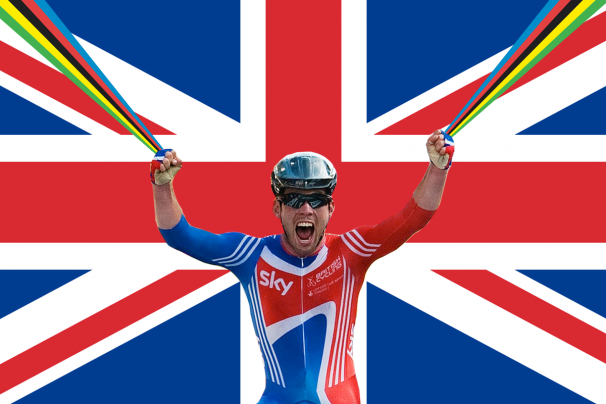 Mark Cavendish is a World Champion! As a sprinter with thirty grand tour stage wins and multiple achievements on the track, Mark Simon Cavendish is widely accepted as the fastest man in the world –a designation earning him many esteemed nicknames. Most commonly known are The Manx Missile or The Manx Express -reference to his Manx ethnicity, hailing from the the mythic Isle of Man (not necessarily a reference or comparison to the tailless Manx cat, also originating from the the Isle of Man). Another moniker (which I have just thought of while writing this) is The Man from Man -again being from the Isle of Man, paired with “The Man” which is both an objective description of his gender and an American Slang term based on the gender stereotype of a male with exemplary masculine qualities and achievements. Although less substantiated, yet another alias is Little Cowboy -referring to Cavendish’s smaller stature and the stereotypical depiction of the Cowboy as the lone figure, living by personal code without external governance etc. Another appropriately given title is simply, Cannonball -again with reference to his compact stature, his immense speed, and his frequent ability to be explosively propelled from a well-organized leadout train during a sprint. And finally who could forget the wildly inventive and perfectly apt Honey Badger -coined by The Heroes, from Bob Roll, as an appropriate adaptation Bernard Hinault’s nickname, The Badger, yet referring to the far more fierce and almost entirely anatomically different African Honey Badger, known as one of the most fearless creatures on the planet and popularized by the Randall adaptation of David Attenbourough’s Honey Badger documentary segment. Although immodest in virtually every other respect, Cavendish has often rejected nicknames, settling on the less-declamatory three letter shortening of his family name: Cav. While still knowing that the Heroes hold great pride in name well-given or the perfectly suited title or phrase, today at Hero Headquarters we have cleared the chalkboard, put down the Saussure, and are saving our chuckles for another day. After a Men’s Elite Race so well-ridden, executed with such precession, strength and ultimately unmatched missile-esque, cannonball-like, Honey Badgering speed, Mark Cavendish now has one title Heroes from around the globe can agree on: we call him World Champion. Tags: 2011 World Championships, Honey Badger, Mark Cavendish, UCI.